Ich habe Diane durch meine Fotos, die ich von Eisbären in den Zoos gemacht und auf Flickr hochgeladen habe, kennengelernt und dann natürlich mir auch ihre Fotos angeschaut, die sie meist in Churchill gemacht hat. Sie hat uns mittlerweile zweimal in Deutschland besucht und uns von ihren Besuchen in der Heimat der Eisbären erzählt. Diane lebt auf der „anderen“ Seite Kanadas in Victoria an der Pazifikküste. Ich hatte sie schon vor einiger Zeit gebeten, einmal einen Bericht über ihre persönliche „Expedition“ zu den Eisbären zu schreiben. I got to know Diane through my photos I took from polar bears in zoos and uploaded on Flickr, and of course I watched her photos from the wild bears in Churchill too. 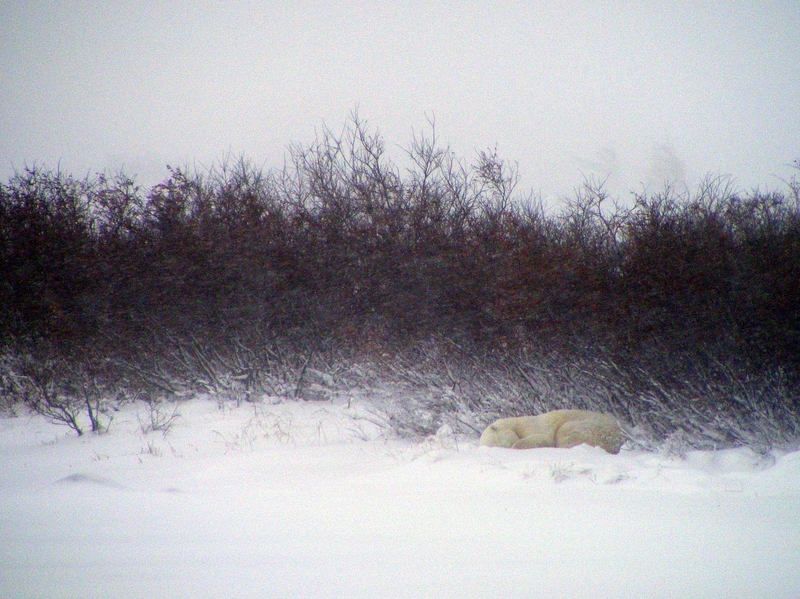 In the meantime she visited us two times and told us about her visits in the polar bears‘ homeland. Diane lives on the „other“ side of Canada in Victoria at Canada’s Pacific coast. I had asked her some time ago to write a report about her private „expedition“ to the polar bears. 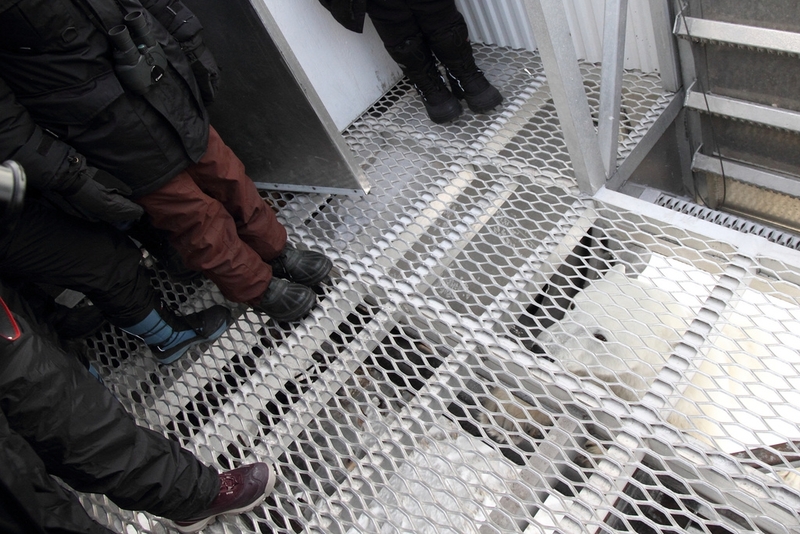 According to Polar Bear Alley’s blogger Kelsey Eliasson “This was a pretty crazy bear season, one of the most dramatic and eventful I can remember.” I was there, and it was pretty busy. I first visited eight years ago, and it was definitely a sleepier experience than it was this year. I guess I should have shut up, rather than telling everyone what a fabulous holiday I’d had, because now there are more tourists every year, and I’m beginning to wonder if that’s a good thing. Certainly some of us are wondering if we’re not making things worse by being there. We do consume airplane fuel, propane, gasoline, and probably more, just to get there. Greenhouse gases! Still I can’t see that we make much difference to a bear’s experience, other than we provide distraction while it’s waiting for the freeze-up and the big feast to follow. Der Blogger Kelsey Eliasson schreibt in seinem Blog „Polar Bear Alley“: „Das war eine ziemlich verrückte Bären Saison, eine der dramatischsten und ereignisreichsten, an die ich mich er erinnern kann.“ Ich war da und es war ziemlich viel los. Ich war vor acht Jahren zum ersten Mal in Churchill und das war definitiv eine verschlafenere Erfahrung als in diesem Jahr. Ich vermute ich hätte besser den Mund halten sollen, als jedermann zu erzählen, was für eine tolle Reise ich gemacht hatte. Denn nun gibt es jedes Jahr mehr und mehr Touristen und ich frage mich langsam, ob das eine gute Sache ist. In der Tat überlegen sich einige von uns, ob wir die Dinge nicht schlimmer machen, weil wir dorthin fahren. Wir verbrauchen Kerosin, Propangas, Diesel und vermutlich noch einiges mehr, um dorthin zu gelangen. Treibhausgase! Trotzdem sehe ich nicht, dass wir einen großen Unterschied ausmachen für die Erlebnisse der Eisbären, außer dass wir ihnen ein bisschen Ablenkung bieten, während sie darauf warten, dass das Meer zufriert und auf das große Fest, dass dann folgt. In my experience there were fewer bears this year. There was already some ice on Hudson’s Bay when I arrived, but we could see free water in the distance. Some people claimed that the reason we saw fewer bears was that many of the bears were already out on the ice. I’m not sure I buy that. In 2009 the freeze-up was so late that the season ended, and we all went home while the bears were still there. I guess no one alerted them to the fact that tourist season was over. That was a terrible year. Freeze- up didn’t occur until early December, and hungry male bears had started to cannibalize cubs. The reason I relate all this to you is that it was four years ago, and generations in polar bear terms are something like 4-5 years. I know that a lot of bears died that year, and now we’re seeing the results. Nach meinen Erfahrungen gab es in diesem Jahr weniger Eisbären. Es gab schon etwas Meereis auf der Hudson Bay, als ich ankam, aber wir konnten in einiger Entfernung noch offenes Wasser sehen. Einige Leute behaupteten, dass die Ursache dafür, dass wir weniger Bären sahen, war, dass viele Eisbären schon draußen auf dem Eis waren. Ich bin nicht sicher, ob ich dem zustimme. 2009 fror das Meer so spät zu, dass die Saison endete und alle Touristen nach Hause abgezogen, während die Bären immer noch in Churchill waren. Ich vermute, niemand hatte ihnen Bescheid gesagt, dass die Touristensaison vorbei war. Das war ein schreckliches Jahr. Das Meer fror erst Anfang Dezember zu und hungrige männliche Eisbären begannen Jungtiere zu fressen. Der Grund, warum ich das hier erzähle, ist, dass dies nun vier Jahre her ist und in vier bis fünf Jahren wird ein Eisbär erwachsen. Wenn wir berücksichtigen, dass vor vier Jahren gerade viele junge Eisbären gestorben sind, dann sehen wir nun das Ergebnis. Still I saw mothers with cubs too, even one of them with twins, and that always fills me with hope. Our third day there, a blizzard arrived, and apparently freeze-up happened promptly after that, so that was more or less according to schedule. On the whole, the bears that were there had quite a good year, and they are out on the ice RIGHT NOW, catching and devouring as many seals as they can find. 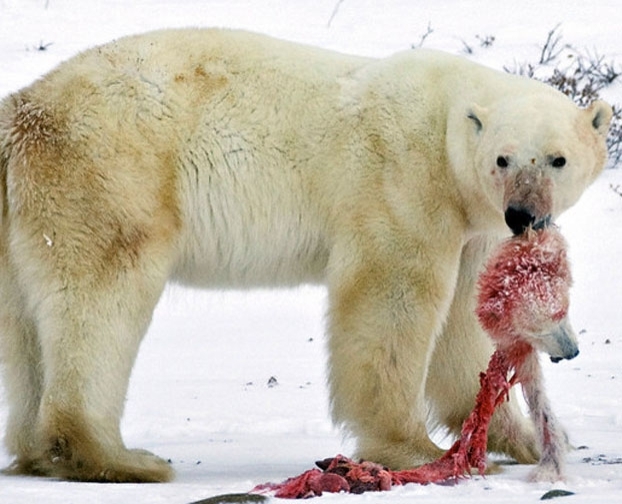 Polar bear fast food. Ich habe Mütter mit Jungtieren beobachtet, sogar eine mit Zwillingen und das gibt mir immer Hoffnung. An unserem dritten Tag, kam ein Schneesturm und augenscheinlich begann danach sofort, dass Meer zuzufrieren, also in diesem Jahr zu einem mehr oder weniger normalen Zeitpunkt. Im Großen und Ganzen ist es ein gutes Jahr für die Bären, die da waren, und sie sind GERADE JETZT auf dem Eis, um so viele Robben wie möglich zu fangen und zu verschlingen. Eisbären Fastfood. In town all seemed as usual until I lost my balance and fell over in Gypsy’s Bakery, knocking over her protective screen arrangement. Patting my shoulder, Helen was very kind to me and shooed me away, perhaps before I could see that real damage had been done. The gift shops were as busy as usual. And, as always happens, some misguided bears showed up in town. Im Ort schien alles wie immer, bis ich das Gleichgewicht verlor und in Gypsy’s Bakery hineinfiel und dabei ihr Schutzschirm Arrangement mitnahm. Helen war sehr nett zu mir und verscheuchte mich, vielleicht damit ich nicht sah, was für einen Schaden ich verursacht hatte. In den Andenkenläden war wie immer jede Menge los. Und wie es jedes Jahr tauchten einige irregeleiteten Eisbären mitten in die Stadt auf. Churchill, you see, is located right in the middle of the natural migratory route of the Western Hudson Bay population of polar bears. They spend a very long food-scarce summer inland then migrate out to the ice in October and November to feed. 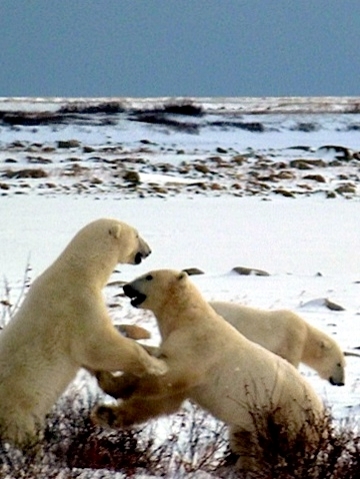 Since the residents of Churchill tend to think they have a right to be there, too, so there are inevitable conflicts. The local “Polar Bear Patrol” goes out of its way to prevent run-ins between people and bears, but polar bears are stealthy and will suddenly show up in the middle of town on Kelsey Boulevard, Churchill’s main drag. There’s an old story about one of them wandering into the Legion and being shooed away. A good story, but I don’t know if it’s true. This year was somewhat better publicized, or possibly more dramatic, than usual. The first incident ended harmlessly. A single cub was spotted running around near the airport, with no mother in sight. I’ve known of other years where this is happened, and the cub was simply left to die. It was seen as a matter of Nature taking its course. 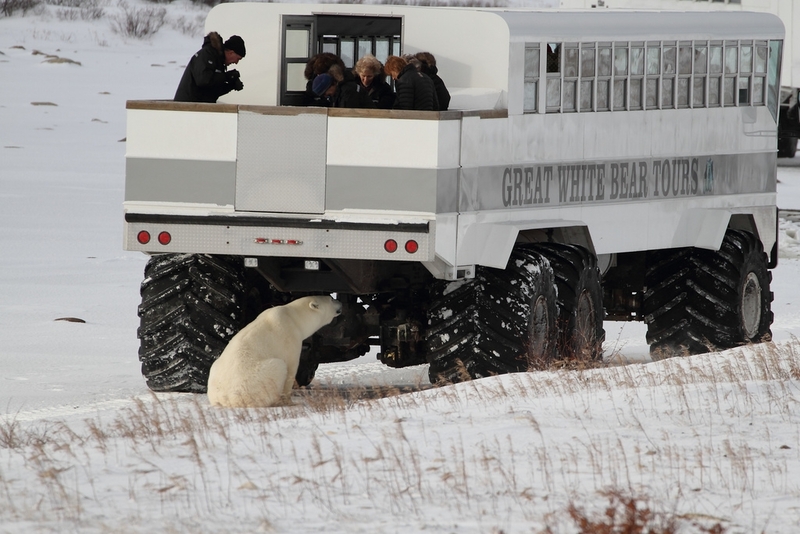 This year, at the Assiniboine Park Zoo in Winnipeg, the new International Polar Bear Conservation Centre has opened, and suddenly the zoo’s population has seen a huge leap. This cub, named Aurora, was taken there, and as a consequence will spend the rest of her life as a zoo bear. I don’t say that that’s a bad thing, just that without a mother to teach her about being a wild bear, she can’t be released back out onto the tundra because she will die. Die Vorkommnisse aus diesem Jahr wurden ein Stück weit besser publiziert als normalerweise oder vielleicht auch nur dramatischer. Der erste Vorfall endete harmlos. Ein einzelnes Jungtier wurde gesehen, wie es in der Nähe des Flughafens herumlief ohne Mutter weit und breit. Ich weiß, dass das auch in anderen Jahren passiert ist, und man das Jungtier sich selbst überlassen hat zum Sterben. Man ließ der Mutter Natur ihren Lauf. In diesem Jahr, dem Jahr, in dem der Assiniboine Park Zoo in Winnipeg sein International Polar Bear Conservation Centre geöffnet hat, erlebt die Zooeisbärenpopulation plötzlich einen beachtlichen Anstieg. Das Jungtier, das nun Aurora genannt wird. wurde dorthin gebracht und wird als Folge ihr restliches Leben als Zooeisbär verbringen. Ich sage damit nicht, dass es eine schlechte Sache ist. Ohne Mutter, die ihr beibringen kann, was ein wilder Eisbär wissen muss, kann man sie nicht wieder in der Tundra aussetzen, weil sie sterben würde. The other three incidents involved humans of various sizes and shapes. One guy was going home at 1:30 a.m. (!) and ran into a wandering bear. He ended up with superficial wounds, and the bear ended up in Winnipeg, where he has teamed up with Hudson. His name is Storm. A female bear was apparently shot, but no details much about the incident, probably because there’s an investigation ongoing. Manitoba allows the shooting of a bear that is threatening someone’s life. This incident resulted in an orphaned female cub, also now in Winnipeg. 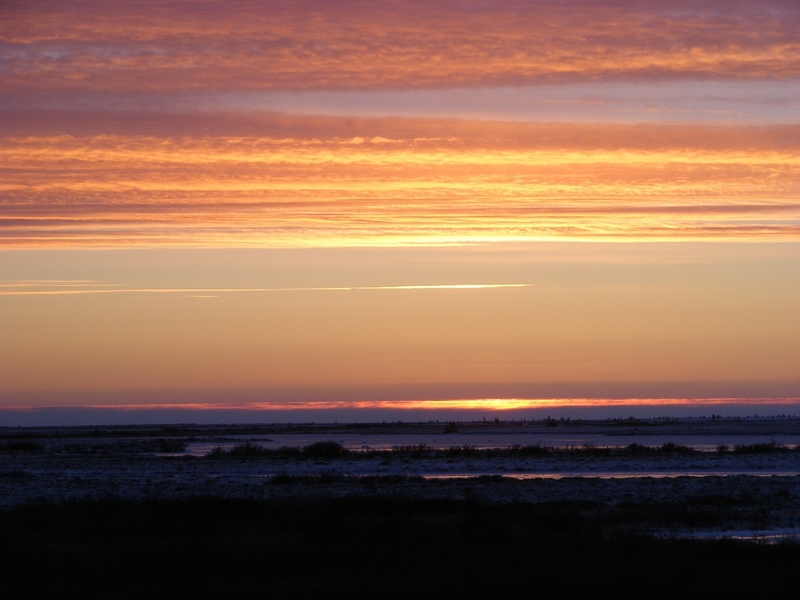 She is being called Kaska, after the Kaskatamagan Wildlife Management Area, a new protected area on CapeChurchill. Finally there was an confused story of an attack on a woman, and later a man, which seemed to involve the whole neighbourhood, trying to scare a bear away. A cracker shell finally did the trick, then a pickup truck made sure he didn’t come back. Manitoba Conservation felt they had to shoot two bears involved in the incident. So sad. I know they don’t make such decisions easily. An drei anderen Vorkommnissen waren Menschen mit unterschiedlicher Absicht und Herkunft beteiligt. Ein Typ ging um 1:30 nachts! nach Hause und rannte in einen herumwandernden Eisbären. Die Geschichte endete für ihn mit ein paar oberflächlichen Wunden und für den Bären endete sie ebenfalls in Winnipeg, wo er mit Hudson vergesellschaftet wird. Er heißt nun Storm. Eine Eisbärin wurde offenbar erschossen, es gibt kaum Details darüber, vielleicht weil noch ermittelt wird. Manitoba erlaubt die Tötung eines Eisbären, wenn er Menschenleben gefährdet hat. Der Vorfall resultierte in einem weiteren verwaisten Eisbärenjungtier, das nun auch in Winnipeg ist. Man taufte sie Kaska nach dem Kaskatamagan Wildlife Management Area, einem neuen Naturschutzgebiet auf dem Cape Churchill. Schließlich gibt es eine konfuse Geschichte von einem Angriff auf eine Frau und später auch einen Mann, bei dem die gesamte Nachbarschaft beteiligt war, den Eisbären zu vertreiben. Ein Schreckschuss hatte schließlich Erfolg und dann sorgte ein Nachbar im Pick-up dafür, dass der Bär auch nicht wiederkam. Die Beamten von Manitoba Conservation hielten es für notwendig, zwei Eisbären, die in diesen Vorfall verwickelt waren zu töten. So traurig. Ich weiß, dass sie eine solche Entscheidung nicht leichtfertig treffen. I’ve come away thinking about the unique experience of Churchill. There’s a mixture of cultures but a melding of interests. It’s really all about the bears. I think back over my short history, and I contemplate Bonnie’s stories of growing up there, when a date meant going out to the dump to watch the bears. Later on Bonnie baked cookies in a cozy kitchen where much of what we now know as “the season” was born. Ian Stirling began his 40-year polar bear career there, and as far as Canada goes, I’d have to say that Dr. Stirling founded polar bear science. He’s retired now, but Dr. Andrew Derocher and others carry on. Zurück in Victoria denke ich über die einzigartige Erfahrung von Churchill nach. Es gibt dort eine Mischung von Kulturen aber eine Verschmelzung der Interessen. Es geht wirklich nur um die Eisbären. Ich denke zurück an meine eigene kurze Geschichte, und erinnere mich an die Geschichten von Bonnie, die in Churchill aufgewachsen ist, ein Date bedeutete für sie zur Müllkippe zu gehen und die Eisbären zu beobachten. Später waren es Bonnies gebackene Kekse in einer gemütlichen Küche, wo das anfing, was wir heute als „die Saison“ kennen. Ian Stirling begann seine 40 Jahre lange Eisbären Kariiere dort und so weit es Kanada betrifft, muss ich sagen, dass Dr. Stirling die Eisbären Forschung gegründet hat. Er ist nun im Ruhestand, aber Dr. Andrew Derocher und andere setzen die Arbeit fort. Hey! Maybe there’s a bear-lift later! I don’t care about lunch! I want to go! Hey! Vielleicht wartet später wieder der Eisbären-Flieger. Ich würde mir keine Gedanken ums Mittagessen machen! Ich hätte Lust ihn zu nehmen! I’m only on the fringes of it all, but I must say that for four days each November, it’s a totally awesome place to be. Ich bin nur am Rande von allem, aber ich muss sagen, dass für vier Tage jeweils im November, Churchill ein total fantastischer Ort ist. Foto: Charles Anderson – Kein Foto von Diane, aber es erinnert mich an sie, denn genau so eine Situation hat sie mir beschrieben. – No photo from Diane, but it reminds me of her story about a similiar situation. 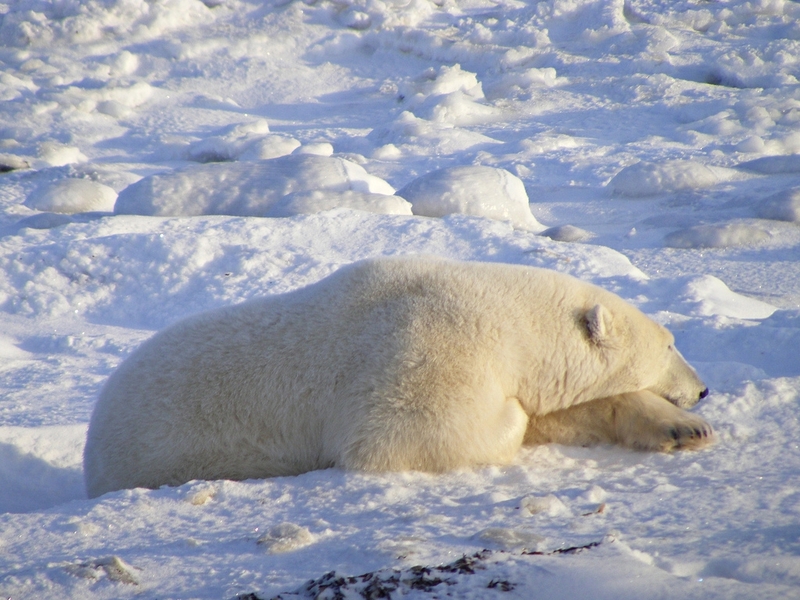 thank you for your impressions from churchill, the polar bear city. churchill must really be a fantastic place despite all the tourists. we press the thumbs for the king of the Arctic and for his country from ice and snow.